McDonald’s Fiji’s Coral Coast Seven 2019 – Hot Glass medals on the way! Hot Glass medals on the way! 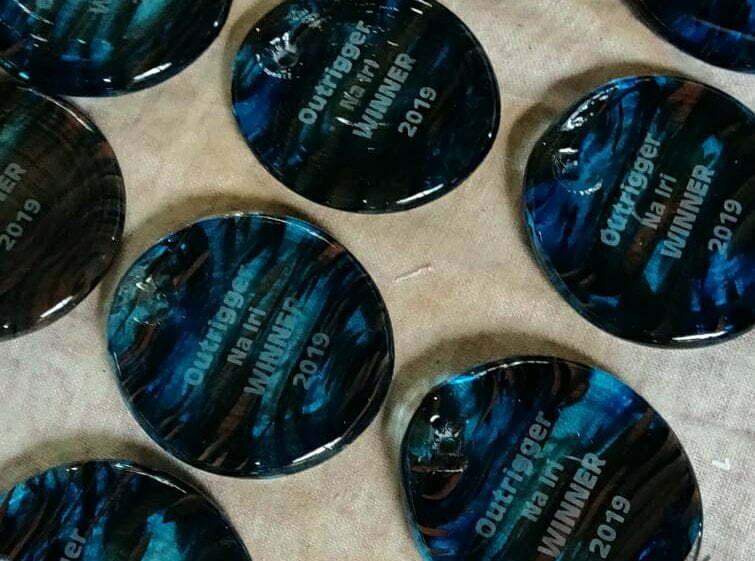 The medals for the winners of the 2019 McDonalds Fiji’s Coral Coast Sevens are now being made at Hot Glass Fiji’s studio in Korotogo. The sponsors colours – the famous red & yellow of McDonalds for the Mens and the eycatching blue and chocolate brown of Outrigger for the Women’s – are rolled and pressed into molten glass at 1100℃. Each medal is individually hand shaped then heat bathed overnight in the lehr, going in at 525℃ and gradually cooled. From the lehr, the wording is carefully sandblasted onto each medal and a hole drilled for the garland of vau to be threaded through. Fresh, individually handcrafted medals – a beautiful keepsake for the winners to treasure! This entry was posted in Snippets from the Studio. Bookmark the permalink. New Carafe & Tumblers set in the gallery.. Hot Glass Fiji’s glass blowing studio is located along tranquil Sunset Strip in Korotogo, on the Coral Coast. Our workshop and gallery is perched on the hillside overlooking the sea.